There’s fresh spinach and asparagus in my Greenmarket now, and I’ve pounced on them with glee as a sign of winter’s end at last. Still, I can’t eat spinach and asparagus every day, so I’ve been looking for new ways to prepare sturdy year-round vegetables in the intervals between meals with spring greenery. I found two promising ones in James Villas’ Country Cooking, one of the books I acquired from the recent Beard House book sale and have been testing out. Villas writes entertainingly about his weekend house in Long Island’s fashionable East Hampton, and the dishes he prepares for what seems like an endless procession of house guests. As with many of the recipes in the book, the two I chose to try can be made mostly in advance and are scalable, making them handy for feeding a crowd and also easy to downsize for just two servings. 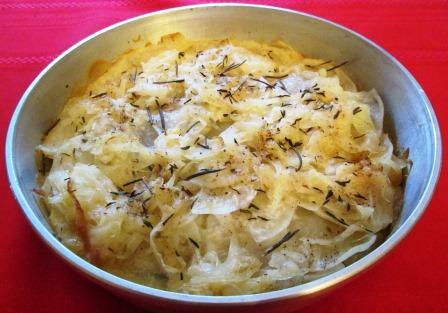 This is essentially a dish of scalloped potatoes, made distinctive by a large amount of onion. I sliced a large Spanish onion and sauteed it in butter for five minutes; sliced a large Russet potato; and spread two layers of each in a baking dish, sprinkling rosemary, thyme, salt, and pepper on the onion layers. 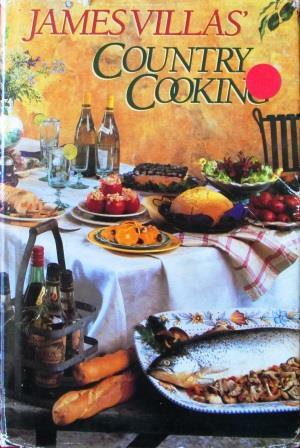 Then I poured in ¼ cup of half-and-half and baked the dish in a 350° oven for 40 minutes covered, 10 minutes uncovered. It was good: dryer than the way I usually make scalloped potatoes, so truly a cake, as the title indicates, but still sufficiently moist. Using half-and-half instead of milk gave it a nice touch of richness. I fear I had too heavy a hand with the rosemary, though, because its flavor dominated the dish more than we’d have liked. Next time less rosemary, more thyme. 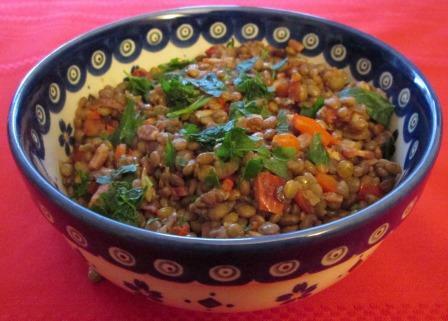 To start this dish, I cooked lentils in plain water until tender, drained them, and set them aside. Then I softened chopped bacon in a skillet and added a mince of onions, red bell pepper, and garlic, and cooked until the bacon was crisp. I stirred in the lentils, thyme, salt, and pepper, cooked five minutes to heat everything through, and served – not forgetting (for once!) to sprinkle on parsley. This was a pleasant change from the way I usually serve lentils. The mixture of flavors was good, with the tiny nuggets of red pepper especially tasty. Tom likes his lentils more moist than these were, but I was perfectly happy with them. Leftovers made a nice little cold dish too. So, while I’ll never have a summer place in East Hampton – I saw a neat little one advertised in a realtor’s brochure this week, priced at a mere $28 million – I guess I can now claim to occasionally eat as the 0.1% does! Thanks for the suggestions. Both dishes look delicious, and your images are great, perfectly frames and the bright red background. Enjoy Spring! Both of these look and sounds delicious, thanks for sharing!